Hello friends. I hope you all are having a nice week so far. I'm really enjoying this week because we've had some warm weather and it feels like spring! Even though it feels like spring I wanted to share with you this crocheted baby hat I made. I recently crocheted this hat and I will donate it to our annual crochet sale that we have at my church. I wanted to make a baby hat to go with a baby poncho that I crocheted and have it as a set. I will share with you the baby poncho I made soon. I needed a pattern to make this crocheted baby hat and I used the pattern that Olga from Lacy Crochet shared on her blog HERE back in January. I used Olga's baby hat pattern but I changed it around a little. Instead of using the single crochet in row 5, I used the double crochet stitch for making the rest of the hat. If you have a chance, please visit Olga's lovely blog Lacy Crochet to see all of her crochet creations and patterns. Thanks Olga for sharing this pattern to make a baby hat for us all to use, as it's just perfect. I love all of your creations and patterns share with everyone. Wishing you all a wonderful weekend and see you all on Monday for our Cooking and Crafting with J & J Link Up. So sweet! I am sure some Nana will be purchasing that one!! That is the sweetest little hat. It reminds me of a baby blanket I crocheted years ago. Good luck with the sale. My mom is very good at crochet and knitting. I invite you to share your sweet hat at our link party, Dishing it & Digging it on Sunday afternoons. The hat is very pretty, love the colors. I have been crocheting lately. Made a soft pink baby throw for a friend that is having a baby and I was please it turned out so well. 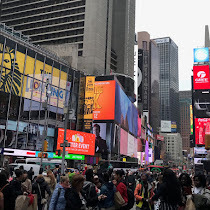 We are enjoying wonderful weather with some rain here and there. Have a great weekend. Cute little hat Julie. I'm glad my pattern was useful. That is so cute! The weather has been gorgeous here too. Loving it! It's adorable Julie, and continue to enjoy the warm weather you've been experiencing. Maybe winter is already gone and spring is just around the corner! Very different from last year for sure. Just lovely Julie! Have a nice weekend ahead! What a sweet little cap Julie. Love the yarn. Have a wonderful weekend. How pretty, Julie, and a great choice of yarn. 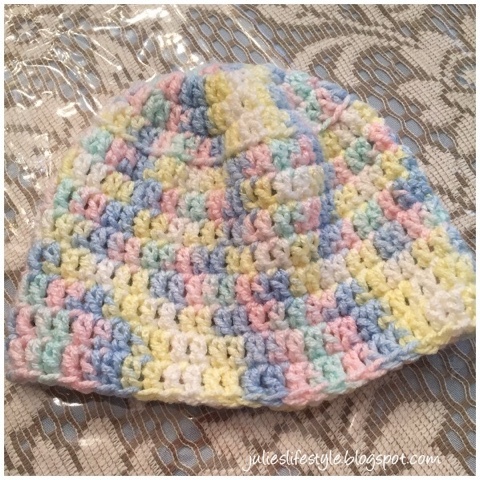 Such lovely colors for a pretty baby hat!! Thanks so much for visiting!! So pretty and I love the soft colors you have chosen.. It's so sweet, Julie! Some baby is going to look adorable in it! This baby hat is adorable, you are so talented my friend. Hi Julie, thanks so much for sharing at DI&DI. I love this adorable baby hat. Such a sweet baby hat! The colors are very spring like! Hope you are doing well my friend. Have a lovely week. Julie, the baby hat is adorable and the colours are really soft and sweet. This hat with the poncho will make a lovely set for some little one. Thank you for sharing and have a delightful day. Love the varigated yarn ... perfect for a little boy or girl. It looks so soft. I love to crochet and this is a great way to use up the stash of baby yarn! I love baby hats! This is so springy. I can't wait to see the poncho :) I bet it is adorable. Thanks for sharing at Over The Moon! So cute! Love the colors! Thank you for sharing at The Really Crafty Link Party! Pinned! Oh, so sweet Julie ~ thank you for sharing @Vintage Charm! So adorable! It turned out lovely!! Thanks for joining the Inspiration Spotlight party. Shared... Hope to see you again soon. Julie, this is so cute! What talent! Pinned and Tweeted. Thanks for sharing at Snickerdoodle Sunday.